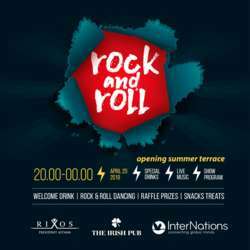 We are thrilled to invite you to the Rock and Roll party and opening of the Summer Terrance at The Irish Pub of Rixos President Hotel Astana. Be the first to party at the terrace and enjoy the views of the modern left bank of Astana. Live music, DJ, special drinks menu, snacks - it’s all what you need for the party mood. Of course don’t miss our traditional lottery with amazing prizes at a stake.